I love cooking, but sometimes I think I need to go back to cooking 101. It never fails. I get excited about trying a new recipe and get to work right away. Halfway through though, I realize I don’t have an ingredient that I could have sworn I had on hand. And then I have to improvise. Oh well. That’s how all the great inventions are made (potato chips, anyone?). Anyway, I was in the middle of making mirza ghassemi when I realized I had no turmeric. As a result, this recipe uses curry powder and dried mustard as a sub. If you want a more authentic taste, just use 1/2 tsp turmeric instead. Either way, it tastes amazing! Pork several holes into the skin of the eggplant. Place on a baking pan and bake for 35 minutes at 400 degrees. Afterwards, let eggplant cool before scooping out flesh and mashing with a potato masher. Set aside. In a deep skillet or pot, heat up olive oil. Add in garlic cloves and sauté for 5 minutes. Add in curry and mustard, stirring for 30 seconds. Add in eggplant flesh. Let cook for 10 minutes, stirring often. Add in tomato, tomato paste, red pepper flakes, salt, and pepper. Cook, occasionally stirring, for another 10 minutes. Move mixture to side of skillet/pot and crack in eggs. 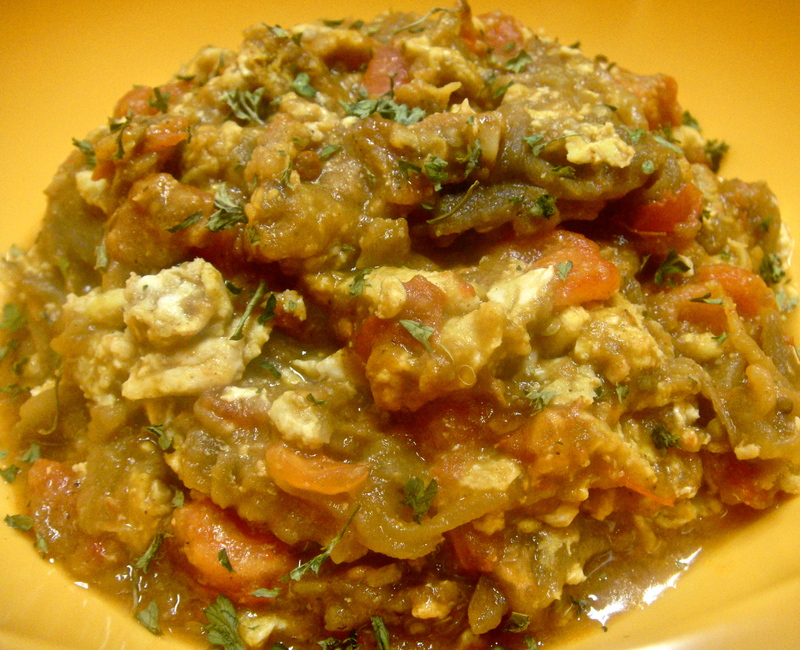 Allow to cook fully and scramble before mixing with the eggplant mixture. Place mirza ghassemi serving bowl and sprinkle with parsley for a garnish.